In the last few years the functionality cost of running Linux operating system shrunk. Good hardware support is one of the last things Linux is lacking when compared to other operating systems. That isn't really Linux community's fault. The hardware manufacturers are to blame for not supporting their own hardware on operating systems other than the proprietary ones. The Linux community developers are actually doing miracles with hardware support and I thank them on doing such a great work. Web cam support was once blind spot on Linux supported hardware list. But today we have Video4Linux video capture framework supported by UVC and GSPCA web cam drivers and most web cams are working happily on our Linux PCs. It can be very confusing for someone who have just installed Ubuntu to discover that his web cam is working, but that he has no control over settings like brightness, contrast, auto exposure etc. 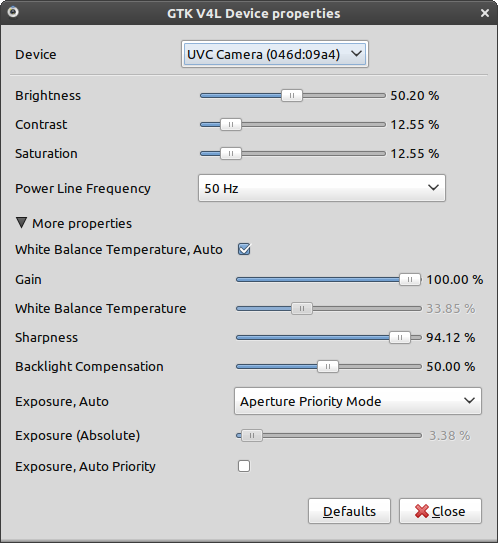 Typical proprietary operating system user would use controls provided by web-cam drivers to adjust these settings. But we're not left out in the cold because Linux community provides means to control our web cams. 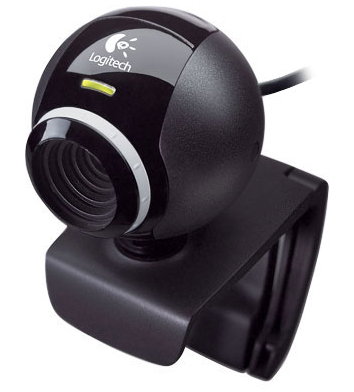 Let me present applications I use on my Ubuntu PC with my Logitech E3500, Logitech E2500 and many other no-name web cams to adjust their video and other settings. First there is Gtk-v4l tool. It's basically control panel for your web cam and has all settings that web cam drivers for other operating system provide for your Video4Linux web cam device. On the screenshot bellow you can see Gtk-v4l user interface. This entry was posted in Linux and tagged Linux, Logitech, Ubuntu, Video4Linux, Webcam on March 9, 2011 by Marko. Sorry to hear about you poor quality when using cam and Flash. Maybe you can play around with Adobe Flash Settings in its settings panel. If web cam is working properly in other applications, Flash is the one to blame and there’s nothing we can do about it cause it’s unfortunately proprietary. Just what I was nneeding and looking for. Hmm, this is useful but I wish I knew of one that also had settings for the resolution. When I use my C910 logitech pro webcam on websites I appear squished. I need to be able to control the aspect ratio somehow. Oh, to elaborate… it has a way for me to set resolution for taking videos, I know, but that doesn’t help for streaming my camera on websites. qv4l2 is in the repository already, and seems to work well. Just another option for people. Could you send here the steps to install qv4l2? Hi, I would like to change the settings of my webcam (contrast, etc…) but I need these changes to persist when I use it in AdobeConnect. I’m connecting to AdobeConnect through Chromium. Is there a way to do that? I tried with guvcview but the changes made are lost as soon as I start my webcam in AdobeConnect. Hi friends, apparently all of the above relates to the case when you have one single webcam. However it happens that I have 2 webcams working under SUSE Linux 42.1, providing my students the frontal view on my face and the downwards view on my desk. As it turns out, one of these webcams works under “uvcvideo” driver and it really works, another one works under “gspca_zc3xx” driver and it doesn’t work at all (black screen). The working one is Logitech QuickCam Communicate MP/55500, the nonworking one is Logitech QuickCam IM/Connect. Now I want to change the driver for the second one with the driver for the first one in hope that the “uvcvideo” driver will make the lazy webcam come back to senses.